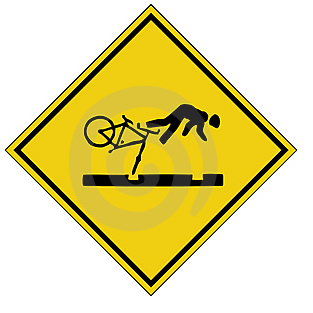 Sidney here, with more cycling related mishaps. One of the problems of whizzing your way through the streets of London on a couple of bits of lightweight aluminum, is that when cars either don't bother to indicate in front of you, or just sort of STOP in front of you for no apparent reason, it's kinda difficult to STOP too, without falling off, especially if you're wearing stupid clip-in shoes. So, Mr Blue Mini Driver who's a bit too friendly with the brake pedal and who thinks it's OK to suddenly STOP in the middle of the road without warning, and who thinks it's OK when a rather gangly bloke disappears from your rearview mirror with a 'Arrrgggghhh' and doesn't bother to STOP again to find out if he's alright, your card is well and truly marked. May bad Karma really screw up your day. 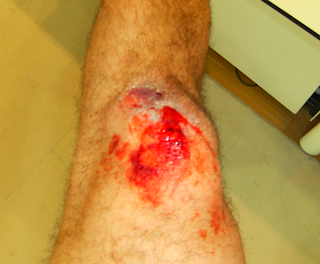 And my knee, now a bit cleaner and a little less bloody, is really stinging and is now sticking to my jeans.